This beautiful map of Chesapeake Bay is a 3-D nautical wood map of the Chesapeake Bay region. More than 150 rivers and streams drain into Chesapeake Bay, the largest estuary in the United States. It drains a basin of over 64,000 square miles into the Atlantic Ocean, but it's actually quite shallow. Its average depth is only 21 feet and almost a quarter of the bay is less than 6 feet deep. Points of Interest Include: Arlington, Baltimore, Dover, Lexington Park, Nanticoke River, Pocomoke Sound, Potomac River, and Washington D.C. Starting with a bathymetric chart (the underwater equivalent of a topographic map), Wood Charts uses laser-cutters to carve the contours into sheets of Baltic birch and glue them together to create a powerful visual depth. 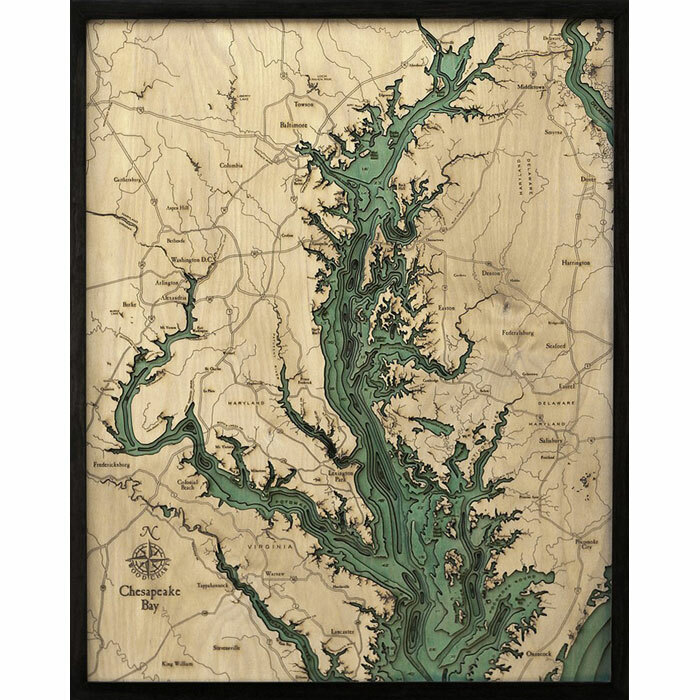 They hand stain select layers a blue-green so it's easy to discern land from water, etch major byways into the land, then frame this work of art in a custom, solid wood frame, protected with a sheet of durable, ultra-transparent acrylic and ready to hang.